The sadistic Afghan warlord who wants to be our friend. “Let’s talk about why you plan to kill me.” It was March 1987, and Milt Bearden was sitting in a spare interview room at the Islamabad headquarters of Pakistan’s Inter-Services Intelligence (ISI) agency. Bearden was then the CIA’s station chief in Islamabad, serving as the link between Washington and the U.S.-funded Afghan rebels bleeding the Soviets in Afghanistan. He had come to see the mujahedin’s most lethal warlord, a radical Islamist named Gulbuddin Hekmatyar. No other Afghan leader had received more money from the United States than Hekmatyar, yet he showed his Western patrons precious little gratitude. He claimed to despise the United States as much as the Soviet Union, and, while visiting the United Nations two years earlier, he had refused an invitation to meet Ronald Reagan in the Oval Office. Now Bearden was hearing grumbling from Washington about why the United States was financing an anti-American zealot known for splashing acid in the faces of unveiled women. He decided it was time to confront a man he considered “the darkest” of the Afghan warlords. And Hekmatyar was convinced he’d come to snuff him. Only prematurely. Fifteen years later, in May 2002, a CIA-operated aerial drone circling near Kabul shot a Hellfire anti-tank missile at a convoy on the ground. The explosion killed several men, but failed to claim its target: Gulbuddin Hekmatyar. By then, the Afghan warlord was on Washington’s most-wanted list as a leader of the post-2001 Afghan insurgency. But, eight years later, circumstances have changed once again. The United States is now considering whether it’s time to stop trying to kill Hekmatyar and start negotiating with him--a choice that could have crucial implications for Barack Obama’s war in Afghanistan. The United States is not fighting one enemy in Afghanistan. While the media often equate “insurgency” with “Taliban,” there are, in fact, three major insurgent groups. The biggest is the Quetta Shura Taliban. Led by the famous one-eyed cleric Mullah Omar, this group is based in the Pakistani city of Quetta and fights mainly in the southern Helmand and Kandahar provinces. Another is the Haqqani network, run by the father-and-son team of Jalaluddin and Sirajuddin Haqqani from Pakistan’s northwestern tribal areas. The Haqqanis and their Al Qaeda allies sow chaos in Afghanistan’s east and were likely behind the double-agent suicide bomb at a CIA base near Khost this winter. Then there is Hekmatyar. His beard now half gray, he is again tormenting foreign infidels. His Hezb-e-Islami Gulbuddin--which translates roughly as “Gulbuddin’s Islamic Party,” shorthanded as HIG by the U.S. military--may be the smallest of the three insurgent wings, but it is “no less lethal” than the others, as the American commander in Afghanistan, Stanley McChrystal, recently put it. That was clear last October 3, when over 150 insurgents overwhelmed a remote outpost in Nuristan Province, killing eight American soldiers and wounding 24. Hekmatyar is believed to have aided and perhaps organized the attack--just the latest ominous sign of what one senior U.S. military official in Kabul calls his increasing activity in the provinces north and east of Kabul. But, while Hekmatyar shares his fellow insurgents’ rhetoric about defeating the Americans, he is not as doctrinaire. A lifelong deal-maker, he cares most about one thing: power. “He wants to ensure he has a role in the government,” says the military official. A thirst for power has driven Hekmatyar for more than 30 years. Indeed, he once nearly ruled Afghanistan. Born to a Pashtun family, he attended a military high school and then Kabul University’s prestigious College of Engineering. But he gave up his studies to join Kabul’s Islamic youth movement, which vehemently opposed the Soviet-backed communists then taking over Afghanistan’s government. In 1972, Hekmatyar murdered a Maoist student, an act that landed him in prison for two years. After his release, he sought refuge in Pakistan, where he founded Hezb-e-Islami in 1975 and developed ties with the ISI. When the Soviet Union invaded Afghanistan, Pakistan was in a high Islamist phase and felt deeply threatened by the godless communists on its border. Hekmatyar became the ISI’s chief proxy warrior against the Soviets--with the help of what would eventually be some $600 million in U.S. aid. He proved a brutally effective warrior. “To the Soviets,” writes George Crile in Charlie Wilson’s War, “he was the bogeyman behind the most unspeakable torture of their captured soldiers. Invariably his name was invoked with new arrivals to keep them from wandering off base unaccompanied, lest they fall into the hands of this depraved fanatic whose specialty, they claimed, was skinning infidels alive.” More effective than such terror, however, was his men’s use of U.S. Stinger missiles and rocket-propelled grenade launchers to destroy countless Soviet tanks and helicopters. After the Soviets completed their withdrawal in 1989, Hekmatyar expected to rule the country. But so did other mujahedin leaders, and vicious fighting ensued. 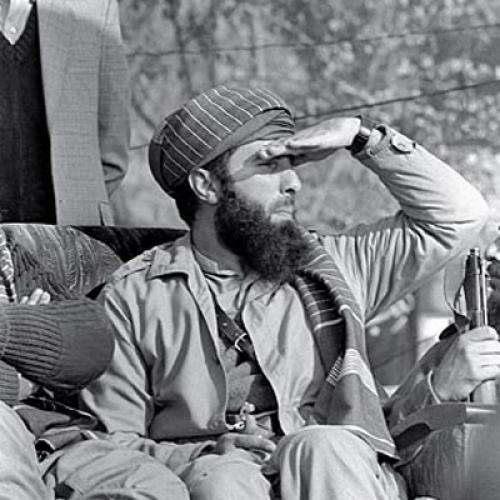 From 1992 to 1994, the Afghan capital became a battleground as Hekmatyar, still in possession of a U.S.-supplied arsenal, wantonly shelled the city. “He was sitting in the suburbs of Kabul, and he was sending rockets, regardless of where they would land. Thousands of Afghans died,” says Ali Jalali, who served as Afghanistan’s interior minister from 2003 to 2005. (In a strange historical footnote, one rocket struck a compound where Hamid Karzai was being held captive by political rivals, allowing him to escape and then flee the country.) “We have already had one and a half million martyrs,” Hekmatyar remorselessly explained in 1992. “We are ready to offer as many to establish a true Islamic republic.” But the Afghan people disagreed. Hekmatyar’s brutality marginalized him, and he was no match for the anti-warlord Taliban movement. Unable to hold his ground militarily when the Taliban stormed Kabul in 1996, Hekmatyar fled to Iran. He was far from finished. After the United States ousted the Taliban in 2001, Hekmatyar was not invited to join the Karzai government, and he resentfully called for a new jihad. Iran expelled him soon after, and he quickly rejoined the fight. Hekmatyar linked up with Al Qaeda--he claims to have helped Osama bin Laden escape from Tora Bora--and, in 2002, took credit for an attempt to kill Karzai. He also likely renewed his ties with the ISI, which, at minimum, has allowed HIG unhindered use of the Shamshatoo refugee camp southeast of Peshawar as a logistics and recruiting hub. Obama administration officials don’t expect to crush the Afghan insurgency militarily. The current U.S. surge aims to turn the momentum of the war and then attempt a political “reconciliation” with elements of the insurgency. The effort will be aimed primarily at low-level combatants and local leaders who fight more for money and parochial reasons than for grand ideology. Senior insurgent leaders, like the Haqqanis and top Quetta Shura Taliban members, are probably just too fanatical to deal with. But Hekmatyar is another story. During the Afghan civil war, he was notorious for casually shifting allegiances, even if it meant allying with blood rivals. “This is a man who has switched sides his whole life,” says the Brookings Institution’s Bruce Riedel, who led the Obama administration’s first Afghanistan review. Hekmatyar has flirted with peace talks for years, but it’s clear that both sides have a keener interest than before. “It’s gotten considerably more serious than it was even a year ago,” says Candace Rondeaux, a Kabul-based analyst for The International Crisis Group. Even though the State Department has officially designates Hekmatyar a wanted terrorist, last April, a Hekmatyar emissary met with an aide to Richard Holbrooke, Obama’s point man for Afghanistan and Pakistan. In January, Hekmatyar’s son attended unofficial reconciliation talks in the Maldives with a group of Afghan legislators. A deal with Hekmatyar could give Obama’s prospects in Afghanistan a huge boost. Even now, American troops are hard-pressed to pacify southern Afghanistan, and the United States can ill afford to see the north slip any further into chaos. Disarming Hekmatyar’s fighters, sometimes estimated to number in the thousands, would be a major strategic boost. And, if a hardened anti-American warlord like Hekmatyar were to renounce violence, that could set an example for his Pashtun admirers throughout the region. Still, cutting a deal with Hekmatyar that grants him legitimized power could amount to a horrendous moral compromise. The Afghan people remember well the blood on Hekmatyar’s hands. “In the urban part of the civil society, it will be like a bomb that will destroy the image of the government,” says Riccardo Redaelli, an Italian academic who studies Afghan politics. Nor is empowering a man who advocates strict Islamic law likely to play well in the United States. “Hekmatyar is a pretty difficult character to sell to the American people,” says Riedel. But these are desperate times. Hamid Karzai is embattled, paranoid, and desperate to shore up his political base. Barack Obama, meanwhile, seems less interested in the political composition of Afghanistan than in reducing violence to a level that will allow for a U.S. withdrawal. “At the end of the day, we’ll take what we can get,” says Riedel. The engineer was right to flatter himself. Michael Crowley is a senior editor of The New Republic.